The Lehigh Valley Wood-Chuckers were invited by The Friends of Allentown Parks to play art of Public Lands Day. 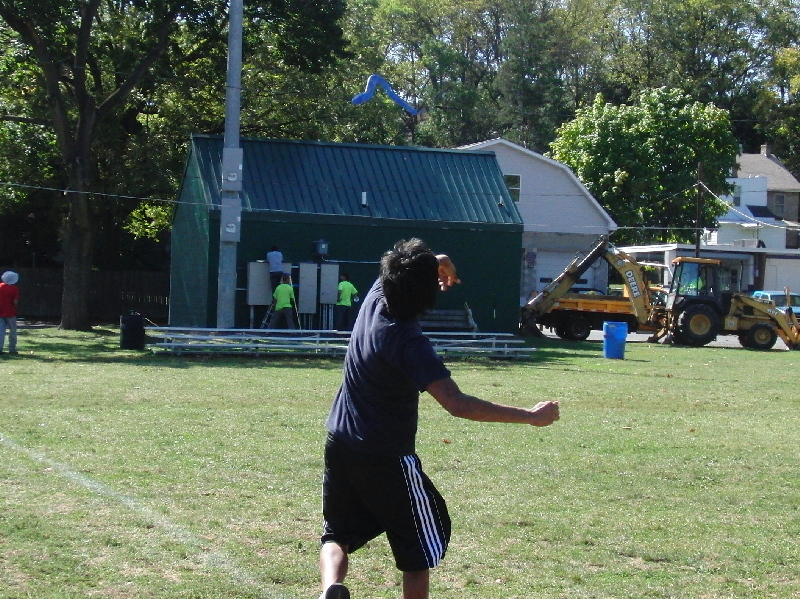 This was held at Jordan Park in Allentown on September 25th. Volunteers were going to be in the park all day sprucing it up. They removed trash, painted outbuildings, cleared shrub and planted new foilage and flowers. As a special rward and to provide a bread from the work, The Wood-Chuckers would provide boomerang demonstrations and lessons from noon to 3PM. Members participating were Rob Stewart, James Fernandes, Barb and Dave Hendricks and newest member, Curt. 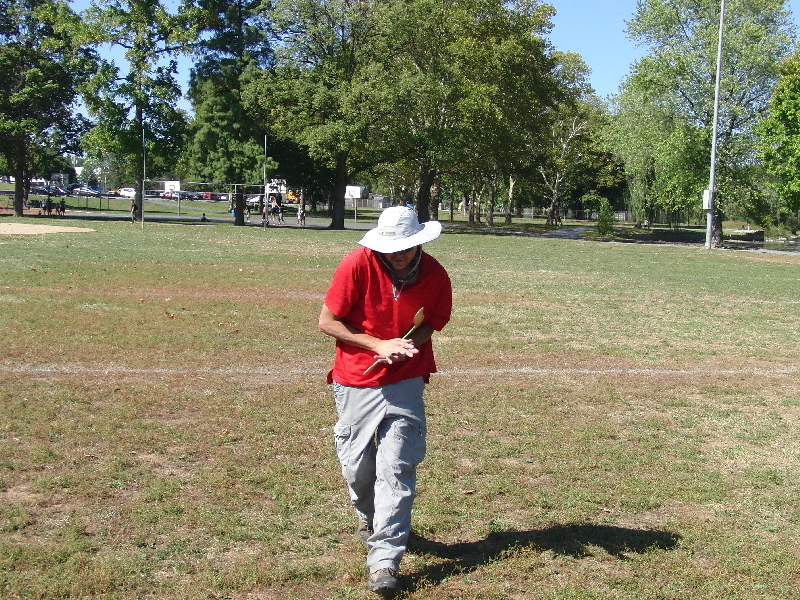 It was quite windy and we were challenged to keep the boomerangs close to us, sometimes catching was impossible. Here is James hauling one in. We had a surprising number of left hand throwers show up. Fortunately I had one of my trusty Vortex booms in left hand for them to use. Here is one new thrower firing off the Vortex. 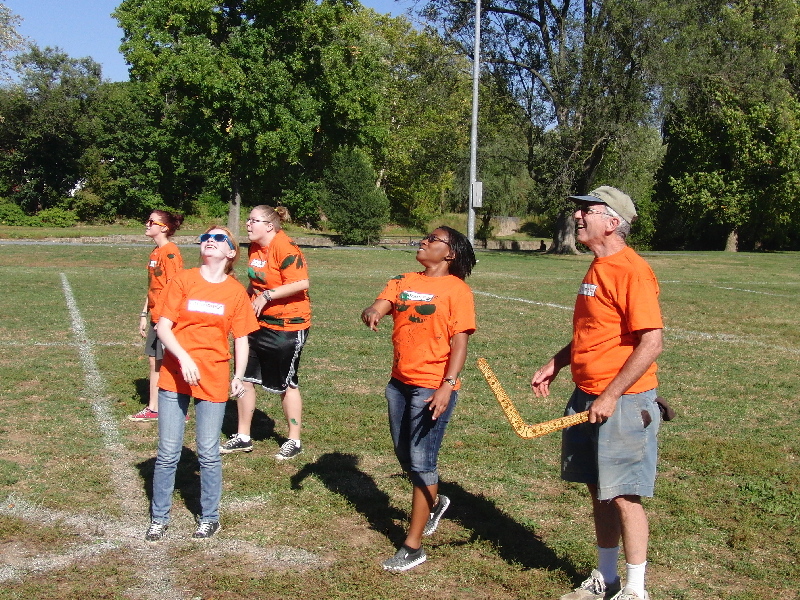 Although it was windy and the field was small, we didn’t lose any boomerangs. Well, James hung a Kilamanjaro in a tree but knocked it out with a baseball. Since there were many newbies, we made sure to have some backyarder boomerangs handy. Here is one young lady volunteer trying ne out. Between 2 and 3 Rob, Curt and James had to leave for other committments. I worked with the last group of volunteers untill 3 and then was going to get ready to leave. Well, Karen, the person running the whole day, came over to tell me that she had a group of local high school students that had worked from 9 until 3pm without a break and were getting a quick lunch. They wanted to learn about boomerangs and could I please stay a bit. Within a couple minues a group of 9 or 10 students, mostly girls, showed up and I os out on the field with them. This group was rather energetic and seemed to be having great fun. He is a photo of them with Don, another local volunteer. It’s interesting to note that they are all wearing orange t-shirts donated by Home Depot. More interesting is the ample amout of green paint on them which was supposed to be put on the outbuildings. I am guessing that even painting was fun for them, or they made sure it was. I stayed on the field until nearly 4PM, almost an hour later than planned. The Friends of Allnetown Parks gave us a nice certificate of appreciation and also made sure we had lunch. The Wood-Chuckers had a good time and are looking forward to our next event together. Today was my first day of class. You see, the company I work for supports a local inner city school in Allentown by providing computers we don’t use. The company has also set up several mentoring programs for the students including reading help, exploratory classes and email buddies. Exploratory classes are held for one hour on a Thursday and run 8 classes total. These are taught by employees and include a variety of hobbies and interests. There are ones on cooking, drafting, model rocketry, jewelry making and more. Since I make boomerangs and have interest in Australia and the Aboriginies, I stuck my neck out and offered to do a class. The class will deal with Aboriginal Dreamtime stories, Aboriginal Art and of course, boomerangs. Today was the introduction. I didn’t realize that the students were assigned to classes and did not choose which class to attend. My class is made up of more girls than boys. We started with introductions and expectations from both the students and teachers. We started by talking briefly about the Dreamtime stories which we will dig deeper into on future classes. Then it was time to introduce the students to some Aboriginal art. We had samples of both dot style and x-ray style. The students leaned what some of the symbols meant and we discussed one of the pieces of art and what it meant. We’ll bring more art in each session. We plan to have the students create their own dot art one session. After the art portion I started showing a number of artifacts I had brought along. A carving on wood, various carved boomerangs, clapsticks, bull roarers and even a nulla nulla. We moved to some old kylies or throwsticks. From there it was modern boomerangs in every imaginable shape. The students enjoyed seeing all the types of boomerangs there could be. 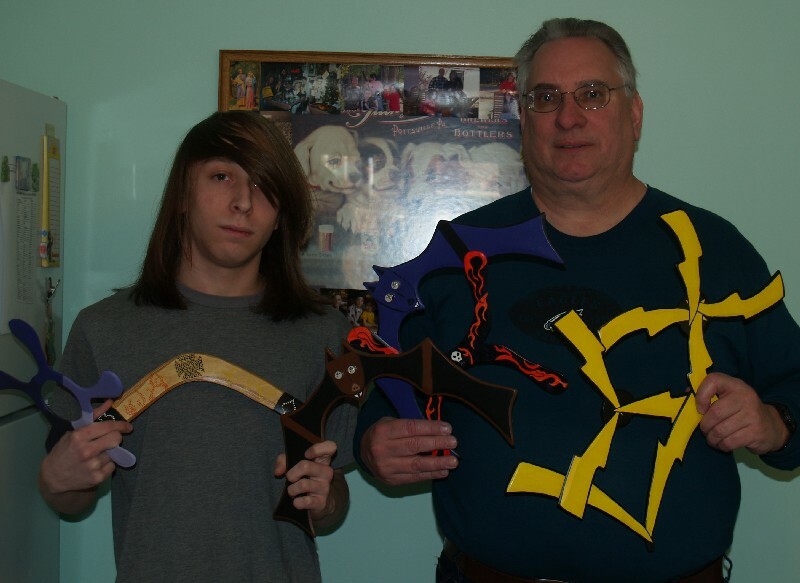 Of particular interest were two bat shaped boomerangs made by former SHS student, Ian Guldner. Ian made these as part of a project he did for his senior year in high school. Ian was my email buddy when he was at SHS and learned about boomerangs from me. Ian’s bat boomerangs took first place in the 2007 USBA National Craftmanship Contest. Quite an accomplishment for a new boomerang builder. Here is a photo of Ian and me along with some of his creations. On tap for next week is a Powerpoint presentation on how boomerangs actually work. We will also make some roomerangs and decorate them before testing them out. I’ll need to find my Dreamtime CD so we can play a story or two. Sorry I haven’t kept up. I really havent been doing much in boomerangs lately. A couple weeks ago I put the finishing touches on a group of Dragon Wing booms I make. The metallic paint on these looks great. 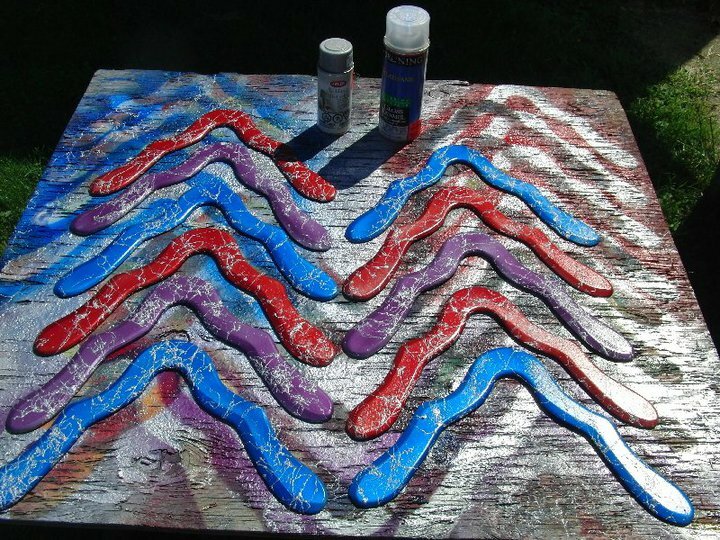 Over the past few days I got a few more boomerangs finished. Top to bottom are 2 copies of Herb Smith’s Imperial, 4 copies of Bruce Bernstein’s Veebru and 1 copy of Herb’s Mount Fuji. Look at an image of Mount Fuji in Japan to see the similarities. I have a few more booms to complete but right now my extra time will go into teaching and doing demos about boomerangs. Tomorrow I start teaching an 8 week course about Aboriginal Dreamtime stories, Aboriginal Art and of course boomerangs. The course will be 1 hour per week and held where I work. The students will be from Sacred Heart School in Allentown. I’ll be assisted by a coworker, Hector Vazquez. 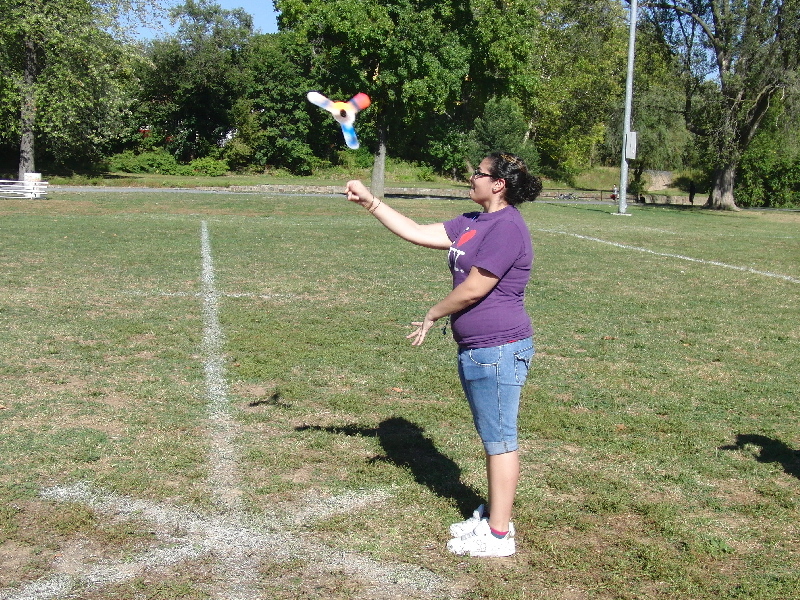 Saturday the Lehigh Valley Wood Chuckers have a demo and boomerang lessons at Jordan Park in Allentown. 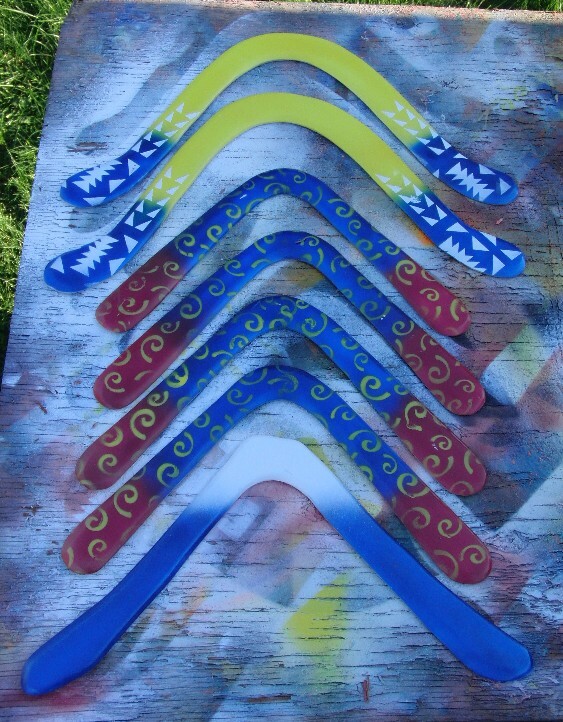 Oct 2nd I will be selling boomerangs at a craft show at East Hills Moravian Church in Bethlehem. Busy boomerang times right now.